Well, the final draft is almost ready for editing and proofreading, and should hopefully be ready to print by this coming early to mid year. 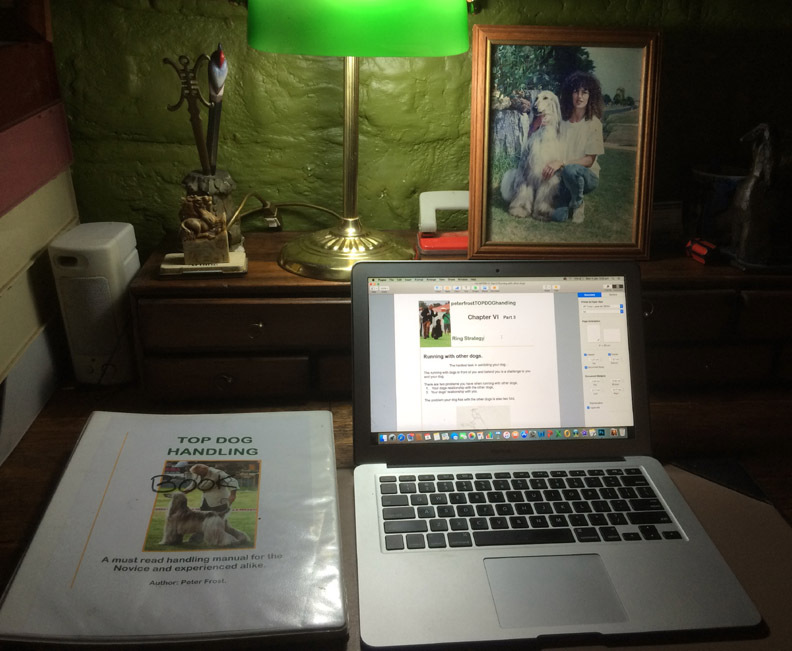 My reason for writing this book is to share the knowledge I have gained from over 40 wonderful years exhibiting pure breed dogs. Not only do I want to leave some record of how I have developed my unique handling methods, I also want to share this knowledge with others in the hope that it will be used to improve the experiences of both handlers and their dogs. In my youth I worked on a farm of approximately 14,000 acres. One of my responsibilities was to move livestock from one paddock to another and check that they had enough water to drink. As I did this on horseback, this task would take most of the day to complete. All the horses used at the farm were ‘brumbies’ (Australian wild horses) that were sourced from the outback. They were ‘broken in’ for riding in a very rough way. This resulted in some very unhappy horses that were extremely ‘hard’ in the mouth. I swore if ever I had a horse, I would never allow them to be treated this way. Later in life, my daughter became deeply involved with horses. I then bought my own horse so I could accompany her on rides. True to my promise, I would ride my palomino gelding ‘Trigger’ with a piece of wool tied between the bit and the reins. Although it took some practice, I was eventually able to train Trigger to respond to almost indiscernible rein signals. Meanwhile, I figured that if I could train a 16.2 HH, 600 kilogram horse to respond to super soft touch signals, then I could also develop a similar technique for the training and handling of dogs. While the touch signals I used with my dogs were already very gentle, these new methods were even more so. My dogs have benefited enormously from these techniques and I believe every handler should be given the opportunity to use them with their own dogs. Thus my forthcoming book ‘TOP DOG handling, has been written to share my story and reveal all the tips, tricks and techniques that I have acquired over my dog handling career. ← Canine aggression. The uncomfortable truth.